When it comes to getting through a busy day, I rely heavily on one of my favorite indulgences….coffee! That little cup of energy, instantly puts a spring in my step. I love the smell of it. And most of all the taste of it. As much as I would love to visit my favorite coffee house in town on a daily basis, as a busy, homeschooling mom that’s just not possible. So I figured out how to recreate some of my favorite coffee house drinks in the comfort of my own home. I’ve already mentioned how to make an Iced Coffee so today I’m sharing another warm weather favorite of mine, a frozen blended coffee. Blended coffees come in a variety of different flavors to match everyone’s tastes. But if you ask me, the regular, plain frozen blended coffee’s are my favorite. These let the flavor of the coffee shine through. Love it! Before making your Frozen Blended Coffee, you must make some espresso ice cubes. To do this simply pour some prepared espresso (I typically will just use whatever is leftover from my morning latte’) into an ice cube tray and freeze until frozen solid. Once frozen then you can begin making your frosty beverage and oh how easy it is! Combine all of the ingredients into a blender and blend until smooth. Pour into your favorite tall glass and enjoy with a straw! I opted to use espresso ice cubes instead of regular ice because this helps the drink not taste watered down as it begins to melt. Also since these ice cubes are espresso that means that they are a lot STRONGER than if one was to freeze regular coffee. So one only needs a couple of ice cubes for that rich coffee flavor, obviously the MORE espresso ice cubes one uses the more intense the coffee flavor will be. I would definitely recommend starting off with only 1 or 2 espresso ice cubes and adding more later if one decides it needs to have a bit more flavor. When it comes to the simple syrup, this is where you can be creative. You can use a regular simple syrup to let the flavor of the coffee shine through or you can go with the coffee house like flavored syrups (vanilla, caramel, hazelnut, etc.) 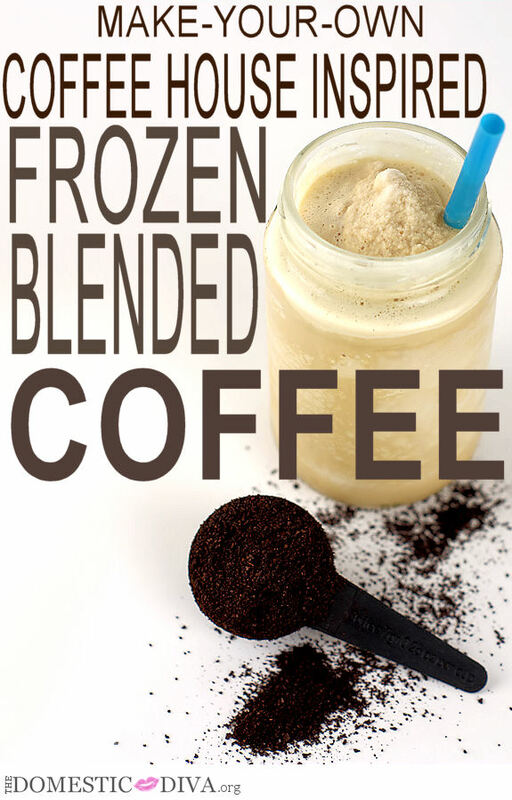 one can find in the coffee aisle at the grocery store to flavor your frozen blended coffee.